This game is a sister to Caribbean Stud Poker. 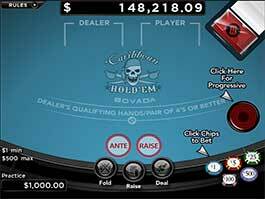 In Caribbean Holdem Poker, you play a variation of Texas Holdem against the casino. You can win the progressive jackpot with a Royal Flush on the first five cards (two player cards and three community cards). You can also win an optional bonus for a progressive jackpot with at least a Flush on the first five cards and a better hand than the dealer's hand. Click the chips to place a bet within table limits, then click Deal. Table limits are displayed in the lower, left-hand side of the game. The dealer is dealt two cards face down and you are dealt two cards face up. Three community cards (called the "Flop") are dealt face up. You predict whether or not your five-card poker hand will beat the dealer's hand. If you believe your hand will be as good or better than the dealer's hand, you Raise. If you believe the dealer will have a better hand, you Fold. Clicking the Raise button makes an additional bet that is twice the Ante. Clicking Fold forfeits the Ante and ends the game. Two more community cards are dealt face up. There are now five community cards that both you and the dealer can use to make the best five-card poker hand possible. Some or all of the five community cards can be used to make the best five-card poker hand. If you did not Fold, and the dealer qualifies, your hand is compared to the dealer's hand to determine the winner. The Dealer qualifies by getting any hand containing a pair of 4's or better. This 5-card poker game is played with a single deck of 52 cards. You play against the Dealer. The dealer must have an ace and a king or higher to qualify. In other words, the lowest qualifying hand would be ace,king,4,3,2 and the highest non-qualifying hand would be ace,queen,jack,10,9. If the dealer does not qualify the player will win even money on his ante wager and the raise will push. If the dealer qualifies and loses to the player, then the ante will pay even money and the raise according to the posted pay table. The progressive side bet will be entrirely based on the poker value of the player's hand. Let 'Em Ride is a variation of poker, except that the Player plays against the house and does not compete against the Dealer or other Players. Let 'Em Ride is dealt from a single deck of 52 cards. The Player is dealt three cards face up and two cards are dealt face down in front of the dealer - these are community cards that are used to complete the player's hand. The objective of the game is to get any winning poker hand consisting of a pair of 10's or higher, using all five cards. 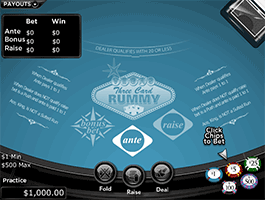 After placing the Ante bet, the Player decides whether or not he wants to Raise the original bet (by the same amount as the original bet), or Continue without a Raise to the next round of play. Once the Player decides to Raise or Continue, the Dealer's first card will be shown. Now the Player has another opportunity to Raise or Continue. If he decides to Raise, the bet will again increase by the original bet amount. 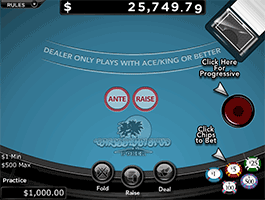 After the Player Raises or Continues, the Dealer's last card is shown. After the Dealer's last card is shown, the Player's hand is evaluated as a normal poker hand, combining the Player's three cards and the Dealer's two cards. The Player does not receive at least a pair of 10's. Deal - Press Deal to begin the game once a wager has been placed. The Player receives 3 cards face up and the Dealer receives 2 cards face down. Continue - Click Continue to show the dealers next card without increasing the wager amount. Raise - Click Raise to increase your wager equal to the original bet amount and reveal the Dealers next card. The Player may participate by placing a side bet of $1 - if the Player does NOT wager $1 in the Progressive slot - no payouts other than from the standard Pay Table will be made. If the Player receives a hand of a Flush or higher (including the Dealer's two cards) then a Payout is made from the table below. 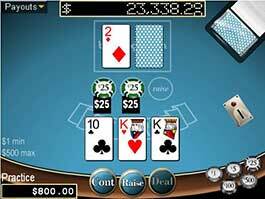 If a Royal Flush is made - the scrolling Jackpot seen at the top of the game is awarded. If a Straight Flush is made, 10% of the Jackpot is paid out. 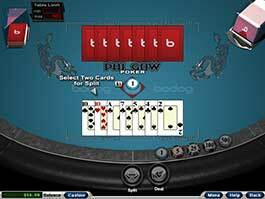 Pai Gow is played with a 53-card deck consisting of a standard deck of 52 cards plus one Joker. The player receives seven cards, which must then be "set" two hands are compared with the dealer's two hands to determine the winner. The game of Tri-Card Poker is played between a Dealer and a Player with a 52-card deck. 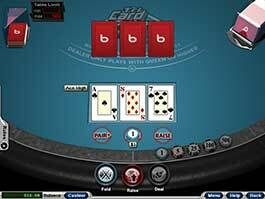 Tri-Card Poker is two games consisting of the Ante and Raise and Pair Plus. The object in the Ante and Raise portion is to receive a higher 3-card poker hand than the Dealer. The object of the Pair Plus game is simply to wager on whether you will receive a 3-card poker hand with any pair or better. The Player may bet on either or both games for any amount within the posted table limit. The wagers do not have to be equal amounts. Both Dealer and Player receive three cards. The Dealers card are dealt face down. Pair Plus winnings are paid based on the pay table located below. Please note - Any three card straight out ranks any three card flush. If the Player believes the hand can beat the Dealers hand, the Player must Raise with a wager equal to the Ante amount. After Raising, the Dealer will reveal its cards. If the Dealer has a Queen or higher it will then compare its hand to the Player, the winner being the highest ranked poker hand. If the Dealer has the highest hand the player loses both the Ante and Raise bets. If the Dealer does not have at least a Queen, the Dealer does not compare hands. The Player is paid 1/1 on the Ante bet and the Raise is returned as a push. If the Player has a straight or better, the Player is paid an Ante bonus according to the chart on the left of the table. Anti - If the Player 3-card poker hand out ranks the Dealers hand. Or if the Player Raises and the Dealer does not qualify with at least a Queen. Raise - If the Players 3-card poker hand outranks the Dealers hand and the Dealer qualifies by having at least a Queen as a high card. Pair Plus -- If the Player is dealt a pair or higher. Raise - If the Dealer has a higher ranked 3-card poker hand. Pair Plus -- If the Player does not receive a minimum of a pair, when dealt three cards. Bet - To place an Ante bet, the Player must click on the Ante circle and then the chip value that they wish to wager. To place a Pair Plus wager click on the Pair+ diamond and then the chip value they wish to wager. Deal - Press Deal to begin the game once a wager has been placed. The Player gets three cards face up and the Dealer gets three cards face down. Raise - If the Player feels they can beat the Dealer, click Raise to continue. The Raise amount will be equal to the Ante. The Dealer's cards are then revealed and compared to the Player's hand to determine a winner. Fold - Clicking on the Fold button ends the current game and forfeits the Ante and Pair Plus bets. The game of Vegas Three Card Rummy is played between the Dealer and the Player with a 52-card deck. The Player is dealt three cards face up and the Dealer is dealt three cards face down. The goal of Vegas Three Card Rummy is to get fewer points than the Dealer. The Dealer's hand must have 20 points or less to qualify. If the Dealer does not qualify, the Player wins even money on the Ante and the Raise is returned. The payout for the Bonus Bet is determined independently from the Dealer's hand. Both Dealer and Player receive three cards. The Dealer's cards are dealt face down. The Bonus Bet is paid based on the pay table located below. IMPORTANT - When a hand can be scored as either a pair or a two-card suited run and neither leads to a lower score, the two-card suited run will always be used to determine the score. When a hand can be scored as either a pair or a two-card suited run, the two-cards that will be chosen will result in the lowest possible score for a given hand. After placing an Ante wager the Player is dealt 3 cards face up and the Dealer receives 3 cards face down. If the Player does not believe their hand can beat the Dealer, the Player can fold the hand and forfeit the Ante wager. If the Player believes the hand can beat the Dealer's hand, the Player must Raise with a wager equal to the Ante amount. After Raising, the Dealer's cards will be revealed. To qualify the Dealer's hand must contain 20 points or less. If qualified, the Dealer's hand will be compared to the Player's hand, the winner having the lowest point total in their hand. If the Dealer has the lowest point total the Player loses both the Ante and Raise bets. If the Dealer does not qualify, the Player wins even money on the Ante and the Raise wager is returned. If the Player has the lowest point total the Ante is paid 1:1 and the Raise wager is paid according to the pay-table (see below). The Bonus Bet is won if the Player's hand contains 12 points or less. The Bonus Bet wager is a not measured against the Dealer's hand, it is paid out based on the point total of the hand dealt, (see pay-table below). If the Player wagers on the Ante and folds the hand the Bonus Bet wager is also forfeited. Raise - If the Player's 3-card point total is less than the Dealer's point total and the Dealer qualifies by having 20 points or less. Bonus Bet - If the Player is dealt 12 points or less. Raise - If the Dealer has a lower point total than the Player. Bonus Bet - If the Player does not receive a point total of 12 points or less. Bet - To place an Ante wager, the Player must click on the Ante circle and then the chip value that they wish to wager. To place a Bonus Bet wager the Player must click on the Bonus Bet diamond and then on the desired chip value they wish to wager. Deal - Press Deal to begin the game once the wagers have been placed. The Player is dealt three cards face up and the Dealer is dealt three cards face down. Fold - Clicking on the Fold button ends the current game and forfeits the Ante and Bonus Bet wagers. Rebet - Clicking on the Rebet button repeats the previous wager(s) and deals the cards.